In a surprising final, the New England Patriots hugely made up ground in the last quarter of the Super Bowl and achieved a groundbreaking win. And while undoubtedly Tom Brady was the most important player in the game, we want to look at the most important players in the Google and Google News world for this event. We have created a special keyword set for a special event – or to be more specific 3 keyword sets: 1 big one and 2 smaller ones for each team. You find all sets at the end of the analysis. For this event we concentrate our attention on the desktop data. First we look at the News Boxes for 4 days (02/03/2017 – 02/06/2017), so we get all the coverage of the big event – beforehand and afterwards. Next we look at the top 5 players throughout Super Bowl Sunday to get a look into the reporting during the game. For the finale, we compare the top 3 publishers for both teams for 3 days straight (02/04/2017 – 02/06/2017). As usual, we lastly sum up the results and then see who the overall media winner is in this year and compare our results with last year’s winners. And if you are interested, you can also have a look at last year’s MVP – Cam Newton. While we only focus on desktop results in this analysis, you can monitor your and your competition’s performance in the mobile SERP with the News Dashboard in real time. Now moving on to the starting point, we analyze the News Boxes for desktop for 4 days. Cbssports.com goes with high percentages from first to fifth place. As you can see cbssports.com holds a share of close to 23 percent for both Friday and Saturday. But on game day, while still on first position, they are not able to keep the big distance and so they are stuck with 16.40 percent visibility. Finally, on Monday they are down to fifth position with a score of 8.05. For all 4 days we have – to no surprise – nfl.com as the runner-up. They start off great with 17.06 percent and they even beat themselves on Monday with 18.73 percent. Another good result scores espn.com on third position. But just as the Falcons, they start off great with 14.01 percent on Friday, but are slowly though steadily decreasing down to 10.45 percent on Monday. Even though their News Box visiblity results suffered from their relaunch a while back (formerly known as espn.go.com), these results show that they are back. Usatoday.com just barely misses the podium, but they up their game impressively on Sunday and Monday. They have a remarkable difference of 7.92 percentage points between their lowest score of 6.10 on Saturday compared to their share of 14.02 on Monday. The last player we will focus on is sbnation.com. They start with a mere 2.07 percent on Friday, but they take it up a notch and reach up to 13.62 percent on Sunday and win the bronze medal for that day. 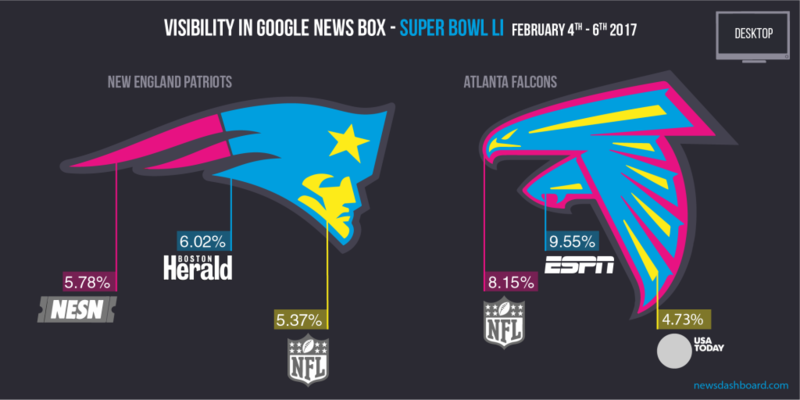 The second graphic we want to look at shows us the top 5 publishers on Super Bowl Sunday. Keep in mind that we see the 24 hour view. Nfl.com and cbssports.com are battling it out in the top ranks. 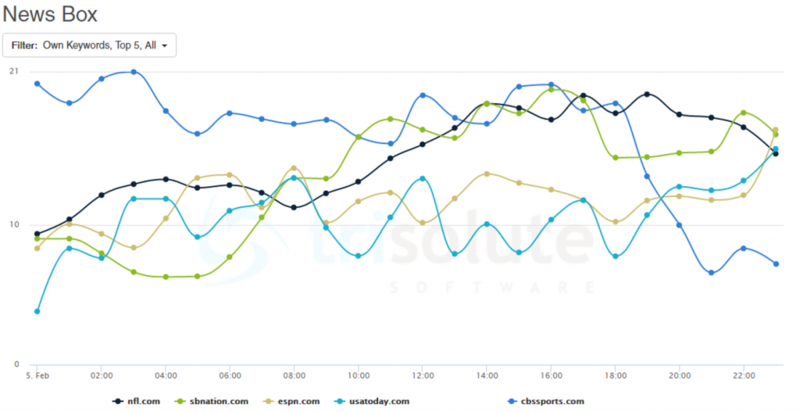 While cbssports.com take the lead again for most of the day, their score drops severely while the game takes place. This may partly be attributed to their simultaneous decrease in indexed articles on Google. Nevertheless, they are down to a score of 6.60 percent at 9pm – from former scores ranging between 15 and 21 percent between 12am and 6pm. Nfl.com is on second position, while they start off with a minimum of 9.38 percent at 12 am, they constantly make their way up throughout the day and they have their maximum at 7pm with a score of 19.38 percent. On third place we have sbnation.com. While they lack a good performance in the early morning, they simultaneously make their way up, really close to our top 2. And, from 7am onwards they stay above 10 percent and even reach up to 19.71 percent visibility at 4pm. 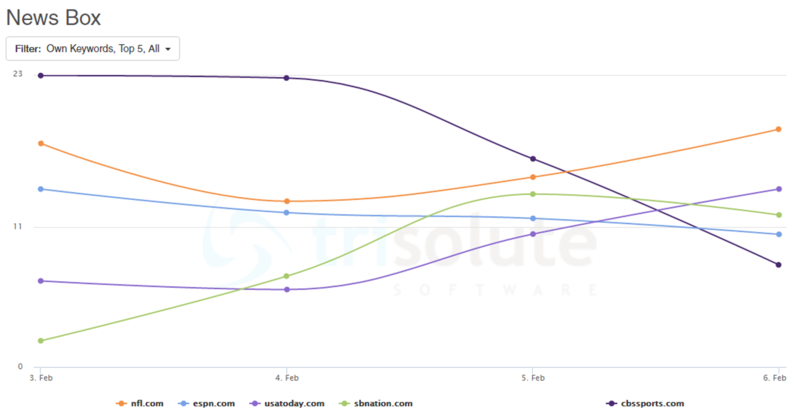 With a somewhat upward, but incredibly shaky curve, we have espn.com and usatoday.com on fourth and fifth position. They stay between 7 and 15 percent between 1am and 10pm, but they reach their all time high at 11pm with 16.84 percent for espn.com and 15.46 percent for usatoday.com. And now – the grand finale: the top 3 publishers in the Google News Boxes for desktop for a special keyword set for each team. You see that the publishers’ field in regards to the Patriots is way more balanced than the visibilities of the Falcons’ top publishers. Nfl.com scores a place in the top 3 in regards to their visibility for both teams. Let us first address the elephant – or better the winner – in the room nfl.com. Nfl.com gets second place with an average visibility of 8.15 percent for all 3 days for the Falcons and third place with 5.37 percent for the Patriots. First place for the Patriots gets bostonherald.com with 6.02 percent visibility, but they do not show up in the Falcon’s top 5. For Atlanta Falcons related keywords is espn.com on top with 9.55 percent and they even score fifth position with the New England Patriots. Second place on the Patriots’ side is achieved by nesn.com with 5.78 percent. Meanwhile, the bronze medal for the Falcons is taken by usatoday.com with 4.73 percent. Only 2 players out of 5 overlap for both teams. As the last step we will sum up the desktop results. Three players of the top 5 of this year (espn.com, nfl.com and usatoday.com) were the top 3 players of last year’s super bowl and this year’s overall winner cbssports.com was on 6th place last year. However, for team specific keywords they did not make the top 5, whereas nfl.com and usatoday.com were also strong for the individualized keyword sets. Keyword set “super bowl li“: 51st super bowl, alan branch, alex mack, andy levitre, atlanta falcons, bill belichick, brooks reed, chris chester, chris long, dan quinn, david andrews, de’vondre campbell, deion jones, devin mccourty, devonta freeman, dont’a hightower, dwight freeney, eric rowe, eric weems, grady jarrett, halftime show 2017, hamish hamilton, houston, jake matthews, jalen collins, jimmy garoppolo, joe thuney, jonathan babineaux, julian edelman, justin coleman, keanu neal, lady gaga, lady gaga halftime show, lagarrette blount, lineup super bowl, logan ryan, luke bryan, malcolm brown, malcolm butler, marcus cannon, matt bryant, matt ryan, matt schaub, mvp 2017, nate solder, national football league, new england patriots, nfl, nfl pregame show, nrg stadium, patrick chung, pepsi halftime show, pepsi zero sugar super bowl li halftime show, puppy bowl 2017, ricardo allen, ricky kirshner, rob ninkovich, robert alford, shaq mason, shea mcclellin, stephen gostkowski, super bowl, super bowl 2017, super bowl 2017 loser, super bowl 2017 winner, super bowl commercials, super bowl li, super bowl live, super bowl livestream, super bowl map, super bowl national anthem, super bowl tailgate, tevin coleman, tom brady, trey flowers, tyson jackson, vic beasley jr.
Keyword set “atlanta falcons”: alex mack, andy levitre, atlanta falcons, brooks reed, chris chester, dan quinn, de’vondre campbell, deion jones, devonta freeman, dwight freeney, eric seems, grady jarrett, jake matthews, jalen collins, jonathan babineaux, keanu neal, matt bryant, matt ryan, matt schaub, ricardo allen, robert alford, tevin coleman, tyson jackson, vic beasley jr.